Garmin has made the already-great Edge 520 a bit greater by loading it with Garmin Cycle Maps. Navigation features previously restricted to the 800 and 1000 series Edge units have made their way to the 500 series, so you get turn-by-turn routing to saved destinations, round-trip routing and more, no connection required. When you're connected to your smartphone, features like Trendline routing and Yelp navigate you to the best any location has to offer. When you create a route, Trendline routing looks at other Garmin Connect users' data for your area, leveraging millions of recorded trips to help you find the best rides and most efficient routes. Real-time Strava segment integration displays nearby segments as you ride, showing how you compare to your PR and the current KOM or QOM (requires Strava premium). Live Tracking continues to evolve, with rider-to-rider pre-set messaging through your connected smartphone. Now you can not only see where your riding partners are, but you can send messages to their compatible Edge units. For those who don’t ride in the concrete jungle, apps like TrailForks let mountain bikers seek out the best trails. Once you have your trail, the 520 Plus navigates you to and through it, letting you focus on what’s in front of you and not where the next trail marker is. Intuitive interface allows fast and easy movement between training, navigation, activity profiles and Connect IQ apps. Onboard North American maps let you navigate to saved points, through courses created or downloaded and transferred through Garmin Connect Mobile or Strava (via the Connet IQ app). The unit even re-routes you if you get off course. Back-to-start feature brings you home safely, directing you back to where you started your ride. Trendline™ routing uses Garmin Connect’s database of riders' routes and tracks to find the most popular way to get you where you're going, letting you ride like a local wherever you are, on- or off-road. Live Tracking during activities (through a connected smartphone) allows you to share your location, speed and more with friends, family or coaches. GroupTrack™ displays the location and telemetry of up to 50 of your contacts who are using compatible Garmin devices, potentially changing group rides as we know them. Pre-set messaging between compatible Edge units, when combined with Live Tracking, means real-time location and messaging – no more stopping to check your phone. Automatically sync your data to a paired smartphone running the free Garmin Connect app, where you can create courses and workouts and send them right to your Edge. Strava Segment integration – both preloaded and on-the-fly (through connection with your phone) – lets you know when your starred segment is about to begin and shows instantaneous data, not just of your performance in the moment, but also how it compares to your PR and the current KOM or QOM, and then provides results once the segment is complete (requires Strava premium). Yelp integration uses the connection with your phone to search out, and navigate to, local points of interest. Training Peaks, Best Bike and TrailForks apps available through Connect IQ. Incident detection uses the Edge’s accelerometers to detect if an accident has occurred. In the case of an accident, the unit sends a signal through your paired smartphone to predefined emergency contacts, letting them know where you are and that you need help. ANT+ sensor support allows you to pair a ton of different sensors and power meters (no Bluetooth sensor support). 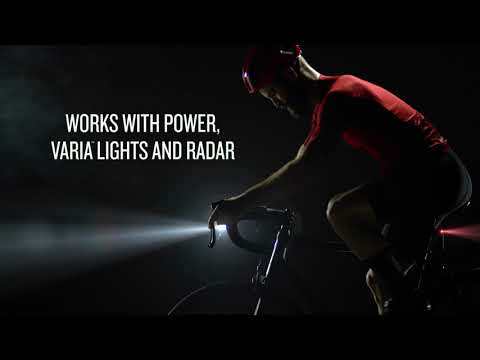 Connects to a variety of Garmin devices including Virb action cameras, Vector power meters, the Varia radar line, heart-rate straps and more. Extended display mode lets you pair your Fenix 5 or Forerunner 935 to your Edge 520 Plus, enabling you to mirror your watch’s information on your 520 Plus – great for triathletes. Physiological metrics includes VO2 max estimate and recovery advisor (requires a heart-rate chest strap, sold separately). Customizable screens let you choose what you want to see, where. Included out-the-front mount holds the Edge flush with the handlebars and allows connection to the external battery pack (sold separately). Shimano Di2 electronic shifting integration. In the box: Edge 520 plus, mounts (flush out-front and standard), USB cable, tether and manuals.